SuperyachtNews.com - Opinion - Better safe than sorry? Among the overabundance of design concepts that are unveiled on a daily basis, are some designers playing it too safe with conceptual design? Among the overabundance of design concepts that are unveiled on a daily basis, it’s interesting to see such a contrast between wildly futuristic design and those which are on the safe side of superyacht design. But the question is, are some designers playing it too safe with their designs? The design world is astoundingly competitive, so when a ‘safe’ looking yacht is unveiled, could it be that this is actually the dangerous move, and designers who unveil these designs are actually the risk takers? If a ‘safe’ design is unveiled, the competition will be twice as fierce as as it would be for a more unique design, and the design studio may also be overlooking a demographic of potential clients who want to see something different. But then again, these designs are incredibly important to the market – perhaps more prominently in the semi-custom market – and ‘safer’ superyacht design is essentially the backbone of the projects that can actually materialise into the fleet. Although some clients want to push the boundaries of superyacht construction, not all clients are quite there yet, and still seeking the more classical superyacht designs. One of the projects which I think is an example of this is the new MD 236 (pictured) by Mulder Design – a beautiful, powerful and well proportioned design, but there is nothing extremely revolutionary about its profile. Having seen a number of designers produce concepts with more classical lines and safer profiles, the competition for this market must be incredibly fierce and difficult to differentiate stylistically. These concepts are important, however, as they are the yachts for which we have the technology to materialise, but conceptual design is also a way of pushing boundaries and creating something different, which helps propel superyacht design forward. 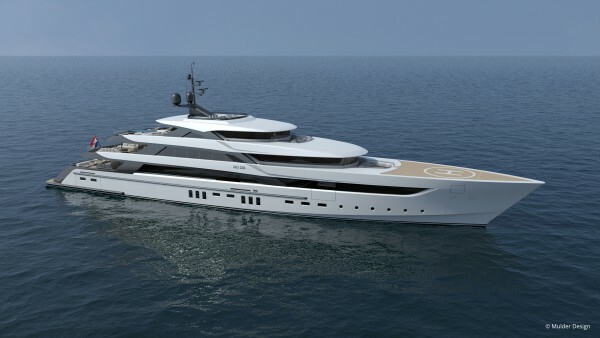 Or perhaps safer superyacht design is the answer to timeless superyachts. After all, owners don’t want their yachts too look out of date at time of delivery, which is more likely to happen with radical superyacht design.